MOHALI – Jonny Bairstow’s composed 89 helped England survive some poor top order shot-making and reach 268 for eight at the close on the first day of the third Test against India on Saturday. Alastair Cook won an important toss but the tourists conceded much of the advantage and would have been in deeper trouble but for India’s poor catching and Bairstow’s dogged resistance. The keeper-batsman featured in 50-plus partnerships with Ben Stokes and the recalled Jos Buttler to revive England, who are 1-0 down in the five-match series. Adil Rashid was batting on four at stumps with Gareth Batty, replacing the injured Zafar Ansari, yet to open his account. “We were obviously, after winning the toss, disappointed at losing those wickets, especially early,” Bairstow told reporters. “We’re fighting, we are in the battle. It can go up to 290-300,” he said about a possible first-innings total. England’s batting mainstay fluffed a pull shot across the line and was trapped leg-before to a perfectly innocuous delivery from the off-spinner. Cook, meanwhile, led a charmed life with Ravindra Jadeja failing to pouch an edge and Ravichandran Ashwin spilling a sitter. Mohammed Shami was the luckless bowler on both occasions. 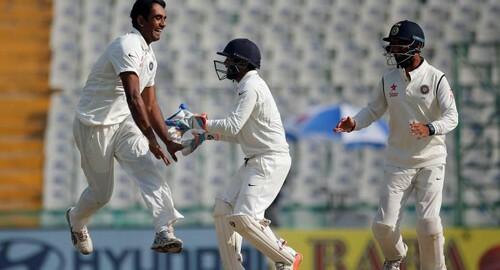 Ashwin redeemed himself with his very first delivery, which Cook edged to wicketkeeper Parthiv Patel. Cook made 27 but his dismissal came from a rash shot chasing a wide ball. Shami finally tasted success when he bounced out Moeen Ali for 16 but Bairstow and Stokes steadied the innings with a 57-run stand before another batsman threw his wicket away. Stokes, on 29, marched down the pitch to Jadeja only to miss the ball and Patel, replacing the injured Wriddhiman Saha behind the stumps, had all the time in the world to whip off the bails. Bairstow teamed up with Buttler to add 69 runs for the sixth wicket in a more productive second session for England. Buttler fell for 43, when he chipped Jadeja to Kohli at extra cover in yet another soft dismissal. The right-hander missed his half-century but still scored 25 more runs than Ben Duckett, who he replaced in the side, amassed in his three innings in India. Bairstow got a reprieve when Patel dropped him off Yadav but the off-spinner trapped the batsman lbw with the very next delivery. England reviewed the decision but Bairstow’s 260-minute vigil, during which he faced 177 balls and hit six boundaries, was over. Chris Woakes, replacing the injured Stuart Broad, made 25. India’s catching was poor but paceman Yadav did not read much into it.